A hacksaw is a versatile type of saw useful for cutting a variety of materials for projects around the home. 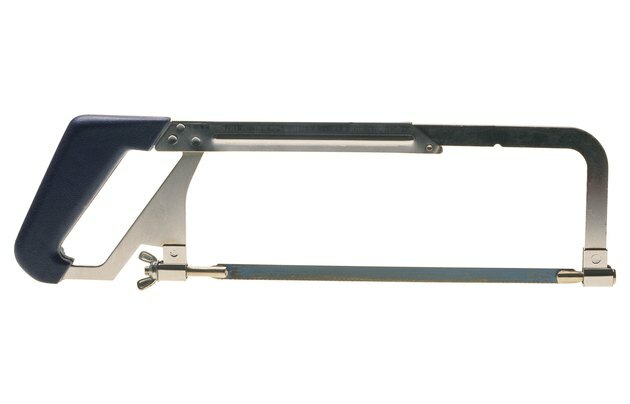 One of the benefits of owning a hacksaw is that one blade can successfully cut metal, plastic and wood. Other types of saws are more specifically geared toward cutting a single type of material. A hacksaw blade can cut many types of materials. When shopping for a hacksaw blade with which to cut steel, look for the term "bi-metal" on the blade's packaging. This type of blade is not only strong enough to cut through steel, it's also designed for optimal strength. Even with regular usage, it's very difficult to break a bi-metal blade because it's designed to bend during use but not crack. The positioning of the hacksaw blade's teeth, known as "tooth set," is an important factor to consider when selecting a blade to cut through steel. Because of durability of steel, select a raker or wavy tooth set. The blade's tooth set is indicated on its package. In the raker tooth set, the blade's teeth are grouped in three, which is ideal for cutting steel. In the wavy tooth set, the blade's teeth are placed in a wave-like pattern for cutting hard objects. Hacksaws are available in different blade lengths, including, 12-, 14- and 16-inch blades. When cutting hard materials such as steel, using a longer blade is typically easiest. With a long blade, it's possible to cut the steel with fewer strokes, as each stroke cuts more than a short blade. Using a short blade to cut hard material is a tiring process, involving plenty of back-and-forth movement with your arm. Because of a hacksaw's versatility, it's not always necessary to purchase a new blade for a task that involves cutting steel. If you have a small amount of steel to cut, you can use a standard hacksaw blade. Investing in a blade designed for cutting hard substances such as steel is generally only necessary when you plan to cut a significant amount of steel.